We have a supped up receiver at Sounds Good To Me that has it all, the Alpine INE-S920HD DVD Receiver, now available in Tempe Arizona near Phoenix, AZ at our auto electronics store, now on sale for $699.95. Features on the S920HD includes my favorites function, built-in i-Personalize sound settings, built-in navigation w/ 3D & 2D mapping, Bluetooth hands-free calling & audio streaming plus Android, Blackberry and iPhone Pandora Control. The S920HD Alpine DVD Receiver works with iPod and iPhone, includes built-in HD, radio with iTunes Tagging, SiriusXM SXV200 and isTuner Ready. So what are you waiting for? Come on into Sounds Good To Me and check out the Alpine S920HD DVD Receiver in store, have it installed on-site and take it home for $699.95! 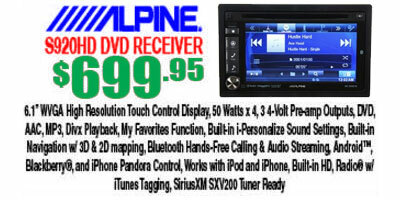 For more information about the Alpine INE-S920HD DVD Receiver visit www.alpine.com. Not sure if it’s new? Does it have all the peripherals that comes with it new and would u take take $400 . The model we have is an ALPINE INE-W960 HDMI, I can do $600.